If being suportive of any political candidate means making up your mind and tuning out of the conversation then I am supportive of nothing. I guess it's time I put my preferences in writing... it doesn't mean I am tuning out of the conversation until November (trust me I will be listening very closely) but I think I will go ahead and come out of the closet. 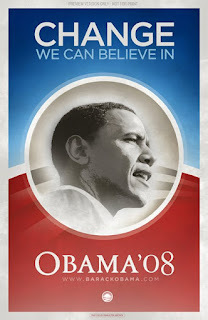 I will probably regret posting this (just like I regret voting for Bush in 2004) but I am an Obama supporter. (pause... to allow the shock to set in). I know I seem like a staunch conservative who will never change his mind (I hope you read sarcasm into that) but, though I am a registered republican, though I want to end abortion (see my recent post on abortion), though I think all politicians are most likely evil... I cannot help but be inspired by the dreams Obama has shared. I really hope he is who he says he is. There... I said it... it doesn't mean I can't change my mind and it doesn't mean I am a democrat and it definately doesn't mean I am a "liberal." Does it mean I am only interested in the interests of the American economy? Certainly not! At this point I don't think we're stepping as far as many other Obama supporters presume we are but I believe we're stepping in the right direction. Go ahead... ask me questions about it, challenge me, I am still thinking and listening. I applaud your thoughts. I have a similar experience. I voted for Bush in 2000. Then I began to deeply regret having done so. I switched from being a long-time registered Republican to an Independent. I then voted for Kerry, but I don't know if I'm entirely happy with that. Mostly I was voting against Bush. Now I find myself somewhat intrigued by Obama and feeling that I cannot vote for McCain. So I will likely vote for Obama, but I'm still sorting it all out. Yeah, it sounds like we can relate to each other. Yes, keep sorting.